She is describing the Skerries Sailing Club new members programme that introduced her to sailing. It was created after we learned why so many newcomers quit sailing clubs within three years. Most said they were not getting enough sailing. Neither, they added, were they meeting many existing members. Seasoned sailors, especially boat owners, slotted in straightaway but neophytes, especially those without boats, often struggle to keep afloat in an alien environment. "It was created after we learned why so many newcomers quit sailing clubs within three years"
Their sailing skills were often not advanced enough to snag crewing spots. They were also unsure of the steps needed to equip themselves with a boat of their own. Some lacked the confidence needed to venture into the maelstrom that is racing. Others had had little or no sail training. We decided to tackle the issue from the ground up. We started with a 10 hour free theory course (to be repeated this year) spread over the month of April aimed at adult newcomers to sailing. "Graduates" are then inducted into weekly Saturday morning sailing sessions. We called it Just Sailing because, initially at any rate, no racing is involved, and white sails only are used. Participants train or improve their skills with experienced members, often in the members' own boats. Rescue cover is provided. A small fleet of club owned boats is also used. These include a Wayfarer, an Omega, a Lasar Stratus, three Topaz dinghies (and a Mermaid awaiting repairs). We also organise short cruises as simple as a spin to a local cove, or slightly more challenging outings such as the circumnavigation of all the Skerries islands, picnic trips to Rush and Loughshinney and, a firm favourite, expeditions to Balbriggan for ice cream. Some keelboat owners also joined in. We have now reached the stage where we rarely have to go begging feverishly for skippers to help out. Volunteers say they enjoy the experience of passing on their skills and helping grow membership. “It's also a great source of crew” says keelboat owner Paul Harrison who regularly takes newbies aboard. Fin Kelleher is a keen dinghy racer but helps with Just Sailing because he also enjoys sailing in a relaxed environment. All Just Sailing sessions end with free coffee and cake where new members can get to know each other as well as meet existing members. During inclement weather we retreat indoors to expand on some theory issues (“just why is it too windy to go sailing today?” or, “exactly how do the tides work around here?”). “For anyone getting into sailing, the presence of experienced sailors is hugely beneficial,” said newcomer Dermot McNevin. “It's also a great opportunity to try out different types of sailing,” said Kate Kitzgerald. One unexpected consequence of Just Sailing was a trickle of existing members, including spouses of boatowners, who asked to join our program. 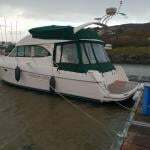 "All the pennies suddenly fell into place," dramatically announced announced one owner' s spouse who had sailed with her husband for years and still felt bewildered until she spent a morning in a Wayfarer with us. We were also joined by some Oppie mums and dads infected with the sailing bug by their children. The only proviso for participation is membership of the club although the first two years is usually on a much reduced incentive subscription (as little as €160 for the first year at 2018 rates). The project has led to a steady increase in membership. Natalia Pacios met her husband at Just Sailing. 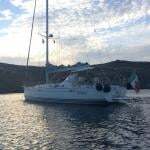 She says it is also a great way of “gathering knowledge on sailing at your own pace”, as well as “having some adventures to nearby harbours”. She has also sampled racing as a crew. “Lovely to leave a busy week behind and indulge in an activity that is time-consuming with plenty of heavy hauling and knots yet nostalgic and romantic,” said Ben Schazman. “Just Sailing is flexible enough to cater for all learning speeds and is fantastic fun,” said Joe O'Coigligh. Gerry Byrne is a former Commodore of Skerries Sailing Club and a freelance Journalist in Science, Business and Aviation.